Give this special smoked salmon recipe its extra flavor with sun-dried tomatoes! 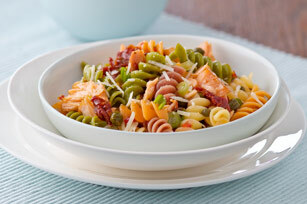 Our Pasta with Smoked Salmon Recipe is a great dish for any night. Cook pasta as directed on package, omitting salt. Rinse with cold water; drain. Place in large bowl. Substitute chopped canned artichoke hearts for the tomatoes.